The TW3370/TW3372 from Tallysman Wireless is a high Gain (40dB) GNSS antenna covering the GPS L1, GLONASS L1 and SBAS (WAAS, EGNOS & MSAS) frequency band (1575 to 1606 MHz). 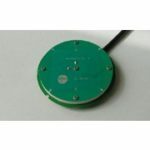 The TW3370/TW3372 from Tallysman Wireless is a high Gain (40dB) GNSS antenna covering the GPS L1, GLONASS L1 and SBAS (WAAS, EGNOS & MSAS) frequency band (1575 to 1606 MHz). It features a patch element with 40% wider bandwidth than previously available in this format. Unlike its competitors, both GPS-L1 and GLONASS signals are included in the 1dB received power bandwidth. The TW3370/TW3372 has a three stage Low Noise Amplifier with a mid-section SAW. A tight pre-filter is available with the TW3372 to protect against saturation by high level sub- harmonics and L-Band signals making it particularly suitable for timing applications. 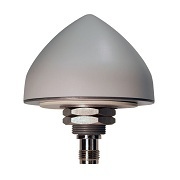 The TW3370/TW3372 has a 19mm (3/4 Inch) though hole, permanent mount white-metal base, with an industrial-grade, IP67 compliant conical radome. The standard connector is a TNC Jack (female). An L-bracket for pole mount is available. Low Power: 9mA typ. at 2.3Vcc min.